Well how to start to tell something about this place when the thing is that you have to see and experience it yourself! Now I can start with one thing and that is, luckily I did! When my school year started and I heard there would be an intern time of five weeks at the end of the school year I decided to go for something new, something in another country. Well, when you know me, you know that this is something like an earthquake. Because I always looked for the simple and easy way to get things done. And going alone to another country was something you wouldn’t even had to bring up in a conversation. But I made my mind up en started to look at the Internet. 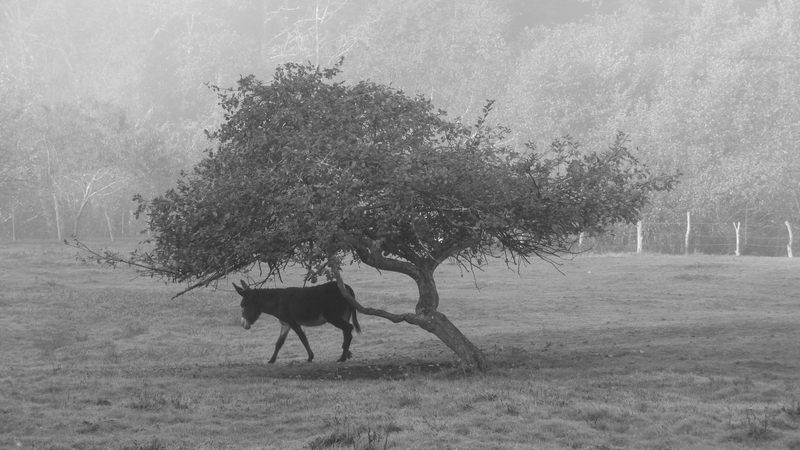 Because I had seen donkeys before and I liked the idea of a warm country (I mean if you do it, you do it right). I started to search at google on the words, donkey and Spain and in a short time I found the web site of the donkey paradise. The first e-mails were sent and in a while everything was arranged, I was going to Spain, to work with donkeys! The day before leaving home I was really nervous, but from the first step in to the donkey paradise it was all gone, the only thing that was left was the feeling of being welcome. And I can say that the feeling of being welcome in this place will probably stay, even when I’m already at home. Working with these unique people and donkeys will be something I can remember and take with me the rest of my life. The animals are all unique and have there own special way of behavior, attention, acting and character. The first day you start with recognizing 3 or 5 individuals. The day you leave, you know them all. Teddy bear Nico, always in for a hug and never getting enough of getting brushed (yeah I admit he is one of my favorites). Or Lola, the pretty girl, always walking side by side with here best friend Anés. Tough guy Rayo, who when I needed to wash him, did not kick one time. Jara, always in for something to eat. And little Joep, who can be a real stubborn man when it comes up to his hooves. Norbert, the big friendly and handsome looking guy. Marco, Leo and Alex, all a bit on the background but all with a friendly and sweet character. Flora, when I came I didn’t dare to brush here but now I almost dare to say that she is starting to like it. In a short while she and Lola will have a competition for being the prettiest. En there is Julliet, the one I have the most respect for. A strong and special donkey, for who I hope there will come a day that she can forget her past and live this life as she deserves to live here life. 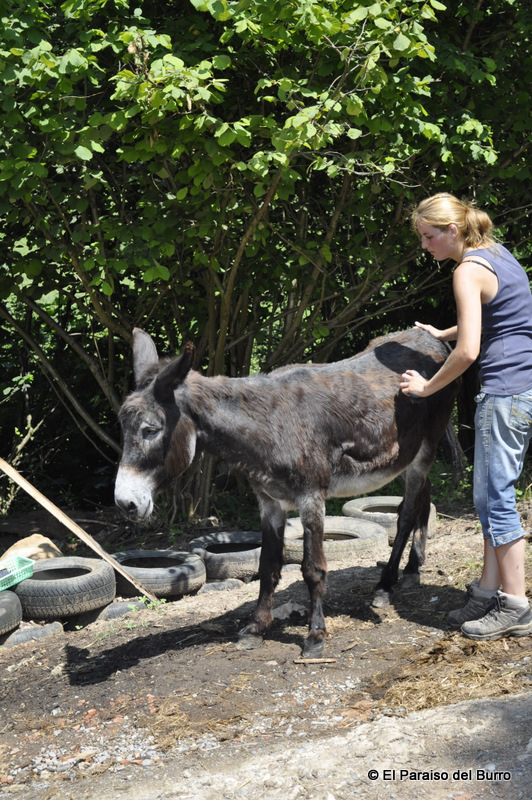 We also have Hannah, the girl I could not get out of the stable, yes I admit, I lost from a donkey. 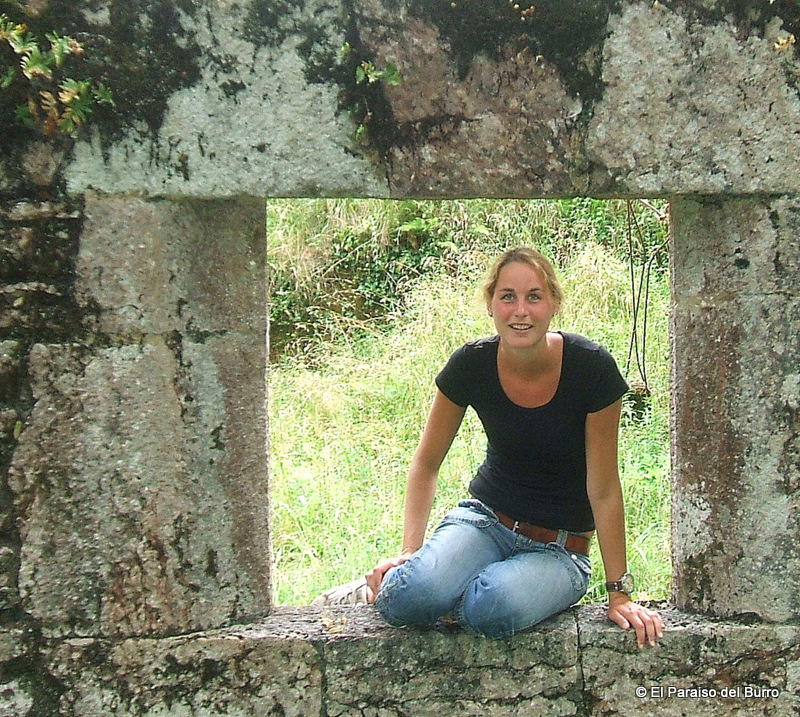 Grietje, hard to recognize, till one day I noticed the two white spots at here back elbows. Kees, the on ho would win a stuffed animal competition with just one look at his fluffy body. Platero, even when he had an abscess at his bag elbow this friendly fellow did not kick, always loves the brushing and even after a while you can start to learn his name 😉 . Tobias, the young looking guy from the group, with his special color easy to recognize. And there is Jip, the king of the dread locks, although he may have to give up his crown after his hair cut a couple of days ago. And then there are the amazing people who live here. To work with these animals, the nature and to welcoming people in there home and there life. I would like to thank Marleen, Tanya and Carla, and al the volunteers for the amazing time I had here. And hope that some day I see them back. For an warm, educative, loving, hugging and interesting internship, I can say, mission accomplished!! After reading Astrid’s blog about Jelle I began thinking about Norbert and wondering if he remembers his old friend. The two were more or less inseparable and if you were looking for one you would usually find the other nearby. Perhaps a donkey is like an elephant and “never forgets”. 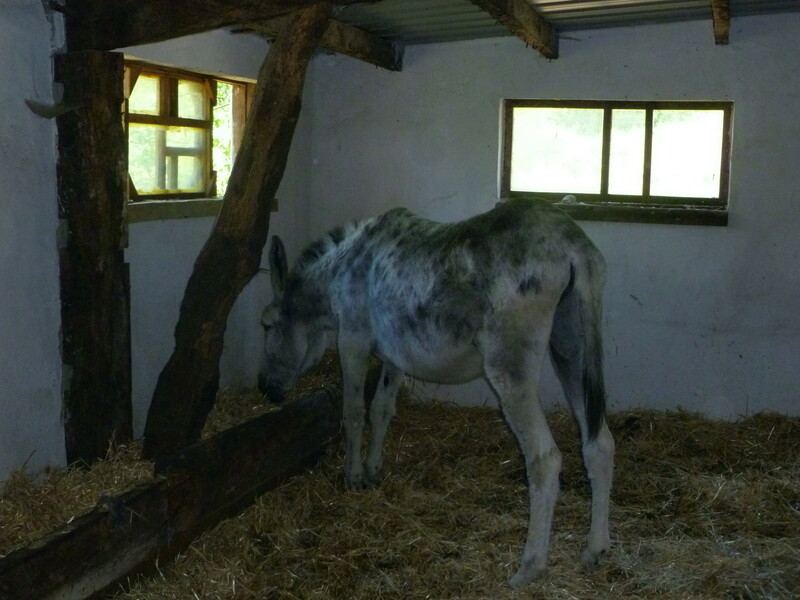 Here is Norbert spending a little time in the new stable on a rather hot day. 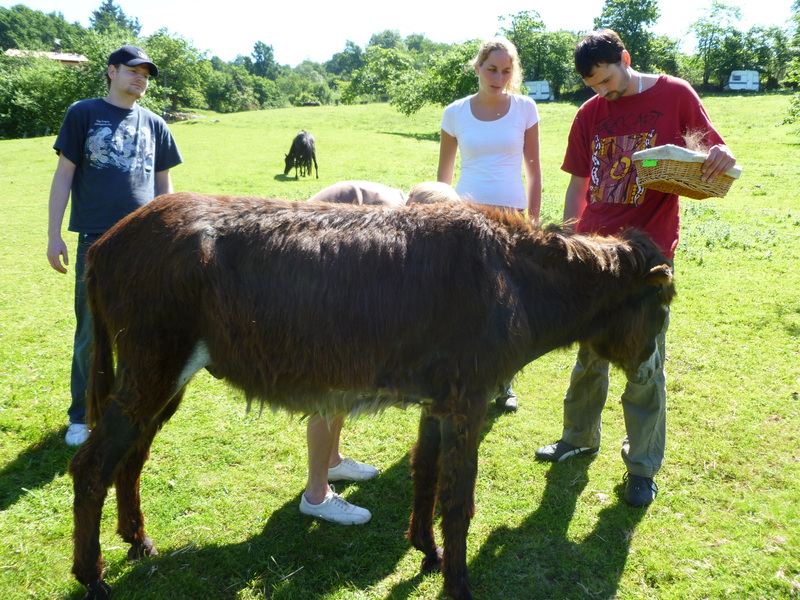 Last year, Norbert was unwell and his carers had to help him to stand on several occasions first thing in the morning, but he recovered well and is now often seen with some of the other males chasing the female donkeys around the fields.